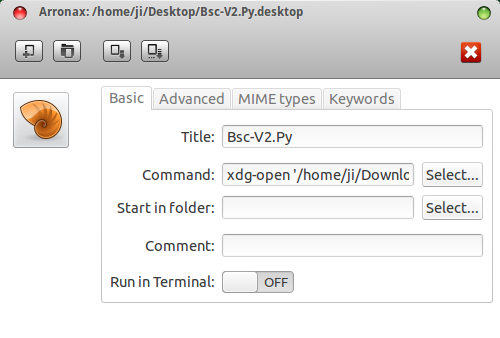 In earlier Ubuntu versions, you can create desktop shortcuts launching favorite applications on right-click-desktop-context-menu. You can create the desktop launchers to quickly run a script and launch system locations, etc. But, Ubuntu 12.04 doesn’t have this option on right-click context menu. This tutorial shows how to easily create desktop launchers in Ubuntu 12.04 Precise using nautilus plugin called arronax. Arronax is a plugin for Nautilus to create and modify application starters (technically: .desktop files). 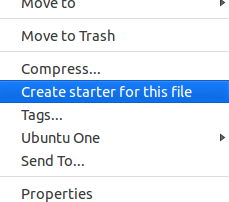 Arronax adds a menu item “Create starter for this file” to the context menu (that’s the menu you get when you right-click a file in the file manager). If the file is an application starter you get an item “Modify this starter” instead. 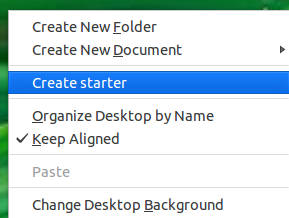 If you have icons on your desktop enabled Arronax adds a menu item “Create starter” to your desktop’s context menu. Then you’ll get this window to modify the launcher. Arronax is alpha software, being developed and tested on Ubuntu 12.04 “Precise Pangolin”. It may have bugs didn’t noticed yet. Use it at your own risk! 6 users responded in " Easily Create Desktop Launchers in Ubuntu 12.04 Precise "
I resolved this problem with UBUntu TWEAK, created a script. Since I installed this on ubuntu 12.04, the system fonts have been completely messed up. Changing the fonts and stuff in Ubuntu Tweak doesn’t take any effect. What does arronax do under the hood? What does it change? Using MyUnity (available in software center) to restore to default settings. This is great! My only problem is after I drag the icon to the Unity launcher, how do I get rid (or hide) of the icon on the desktop?